I use 55 gal. plastic barrels, two 2x6 boards 2 ft long. 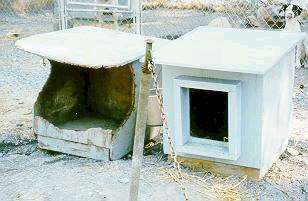 Cut dog opening at top of barrel, then lay on side. Take your two 2x6 boards and cut half circles to fit at bottom of barrel. Tack on 2 inches from front and same at back of barrel. Use drywall screws and reach inside barrel and screw barrel to boards. Usually 10 screws is enough to hold legs in place. If you want, add a 2 ft x 4 ft plywood board for top so dogs can stand on. Bolt these on and use 2x2 board 4 ft long on each side between curve of barrel and under plywood for more stability. Note: If you use used barrels make sure they are cleaned out very well and don't use if toxins where used in the barrels. I go to janitorial suppliers and get mine for free. So check it out. FIRST, instead of using chunks of 4 x 4's for each corner of the base, use a solid perimeter (such as 2 x 4's) to keep the floor of the house off the ground. This way you won't be having to retrieve toys and bones from underneath the house. Dogs digging to fetch items that disappear in this manner will be discouraged. The more important reason for a solid base is, if you have small puppies living in that house, they can't get stuck underneath! Our SECOND tip is the use of wood or drywall screws to assemble the dog house instead of nails. It is much easier to remove and replace chewed up panels (door panels seem to be especially vulnerable) when a portable screwdriver can be switched into reverse as opposed to using a crowbar or nail puller to remove more permanently attached sections. I recently built a bunch of new plywood dog houses and installed a piece of rigid foam insulation (1" thick "pink or blueboard") under the floor. These houses have recessed removable floors supported by 2x2 cleats on the sides and ends of the house. I simply cut the foam to match the floors and inserted the foam first securing it between the cleats and the floor itself. It works great. The insulation prevents condensation from forming and the straw doesn't freeze to the floor. The houses are easier to keep clean, I go through less straw and the dogs seem a lot more cozy in their houses. Not to mention, fewer calories being spent on maintaining body temp means more available for maintaining weight and repairing tissue. How ever you attach the foam be sure that the dogs cannot chew on it. My houses rest on wooden pallets and I haven't had any problems. Every year it seemed like we were having to replace dog houses because the dogs had chewed them all up. Young dogs of course are the worst. This year as I brought dog houses in to replace roofs & fronts and repaint, I decided to outsmart the dogs. Using a technique I learned when I had horses, I went to the local hardware store and picked up some J-molding and bead-x like they use on sheet rock. The J-molding I used around the roof & the bead-x on the corners. They cannot chew through it and after a couple of tries they stop trying. After making sure there were no sharp edges, I painted the whole house. I have a couple of houses that I had done this with ten years ago and as long as I give them a coat of paint once in awhile they look like new. Houses are expensive and it's nice to keep them in good condition. See the difference between the protected & unprotected.